Located in the mix of Tampa's hottest district (SOHO), The Lime is one of the restaurants I've been meaning to try. More than its meals, The Lime offers something for all of your senses, lending uniqueness in the middle of the South Tampa restaurant scene. With its lively atmosphere, The Lime captures you from the moment you walk in. This establishment is trendy and fun with a bustling crowd. A beautiful mural adorns a wall. Comfy, green booths and couches are available, offering an easy and relaxed at-home feel. The music playing (sometimes by a live DJ) is definitely noteworthy. The big flat screen TVs along the walls make this a great place to enjoy a game. The Lime boasts that they have the best margaritas in Tampa and fortunatly for their patrons, they are right! I was drawn to the Marcorona, a huge house margarita with a nice Corona sticking out. This margarita will not disappoint! 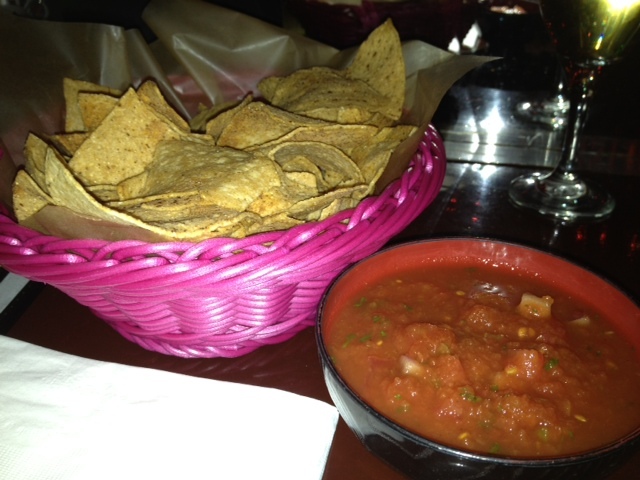 Pair the Marcorona with their bottomless chips and salsa and you have the perfect start to a meal. The Lime offers both sea salt and chili-rubbed chip options and between the two, I was impressed with the chili-rubbed. Even more impressive was the quality of their salsa. The salsa is made fresh daily and you can easily taste each individual ingredient. We finished the bowl in record time. At about this time we were introduced to the manager, Jordan. Highly knowledgeable about his restaurant, Jordan was willing to answer all questions we had about the establishment, including bar selections and menu design (there is a revamp on the way- stay tuned!). He was seen continuously interacting with the crowd and assisting the staff with delivery of food to the tables and clean up. Jordan, taking great pride in his beer selection, he personally teaches his staff members the ins and outs of the distinct brews offered. Offering 22 beers on tap (switched out on a regular basis) and more than a dozen crafts, The Lime is a domestic beer house for every taste. When I shared that I wasn't quite on his level, he recommended a beer that he thought I'd enjoy. When I tried this beer, I knew that Jordan's advice was not to be taken lightly. From there, he recommended other dishes and let us know that if we loved spicy, be sure to request julienned peppers. The Lime's menu is composed of Tapas, Salads, Fiesta Bowls, Tacos, Sandwiches, Quesadillas and other traditional Mexican fare. Encouraged to try a little bit of everything, we did! On the Tapas menu, we opted for the Pollo Roll 'Yo and Fried Avocado Fries- both recommended by our bartender, Shelby. As an aside, we highly recommend Shelby! The Pollo Roll 'Yo, avocado glazed buffalo chicken, crispy onions, julienne jalapenos & celery with bleu cheese crumbles & lime caesar dressing rolled in a tortilla and cut sushi–style, was one of my favorites of the night. The avocado glaze made this buffalo chicken unique and the lime caesar dressing paired nicely with the other ingredients, giving the rolls a clean and crisp flavor. The Avocado Fries, another favorite, is lightly breaded and fried and sits on a bed of lettuce and pico de gallo. Aioli is offered as a dipping sauce, a perfect complement. For the main meals, we turned to both Jordan and Shelby for recommendations and ultimately decided to sample some tacos and fiesta bowls! We ordered The Street Trio, where you can choose a combination of any three street tacos with a side of rice and beans. The tacos we picked were Picadillo (seasoned ground beef, rice, refried beans, cilantro, jalapenos and salsa fresca), Carne Asada (grilled marinate skirt steak, salsa fresca, cabbage and grilled tomatillo sauce) and Ancho Chicken (grilled chicken breast, avocado, pickled red onions, cilantro, queso fresco and chile de arbol). All tacos are served on fresh-made soft corn tortillas. The tacos tasted completely different and I thoroughly enjoyed each one. I will say, though, that the Ancho Chicken was so good that it blew the other amazing tacos out of the water. Next, we sampled two fiesta bowls: Ropa Vieja (Cuban shredded beef, pickled onions, peppers, tomatoes, plantains, black beans and mojo vinaigrette) and Habanero Beef (spicy shredded beef and carrots with citrus vinaigrette and topped with queso crumbles, pico de gallo and mariachi aioli). All of the Fiesta Bowls come with citrus jasmine rice, napa cabbage and fresh vegetables, with the option to substitute for brown rice. There are also bowls that are served stir-fry style, without cabbage. Again, I loved both bowls, but the Habanero Beef took the cake. It had the perfect amount of spicy and the sauces were unbelievably good. When it came time for dessert, we decided to go for the Churros, served with vanilla bean ice cream. One thing I didn't order was the guacamole, but I did notice that each table that ordered a side of this delicious dip was met with their personal guacamole maker. That's right- when you place this order, the 'guac man' will show up at your table with a cart full of all of the trimmings for a perfect guacamole and he'll make your guac fresh before your eyes. This is definitely something I will experience next time! Something we really loved about The Lime was the bar options. In addition to the 22 beers on tap, they offer a Fiesta Hour daily from 2pm-7pm and large tabletop drink dispensers that can be filled with any drink of your choice. Fridays- Free tequila shots at 11pm! On weekends, from 10am-3pm, brunch is offered. The Lime, after just one visit, is already a favorite experience of mine! Beautiful people, great food, good times and catchy music make The Lime one of Tampa's best spots for dinner and then some! YUM this post is making me want one of those margaritas and all the food looks so delish. Especially the churros mmmm! I have been to Lime once for brunch, but never for dinner. That Marcoronas looks yummy! I will have to check it out. Who this looks like a great place! That is one huge Margarita! We were just south in the Ft. Myers area for vacation. I love Florida! I meant to type WOW not who! I wanna go! It looks SO yummy. Maybe we can plan a bloggers lunch/ brunch there. Think they can handle all of us? Lol. Wow that looks delicioso! Next time I'm in Tampa! You have been selected for an award. If you wish to claim it come to my site. Congratulations!